Has anyone else noticed that heart candy just ain't what it used to be. While I was crunching on my Necco Sweathearts that my valentine gave to me this morning, I was a little puzzled by some of the messages on the candy, so I just had to snap a couple of photos as evidence. 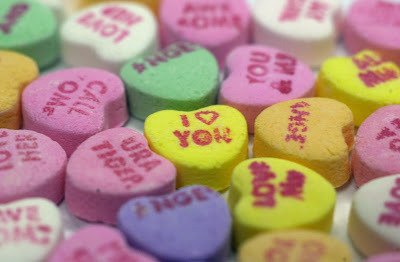 Since when is "and" an appropriate message to put on a candy heart? And what does this say, "Lap Dog"? Does Necco need more proofreaders? At any rate, one of my enduring memories of Valentine's Day present and past is opening up a box from my valentine and seeing a candy like the one below.